Technology has impacted almost every aspect of life today, and education is no exception. Schools are also effectively deploying the latest technology in the classrooms for a better teaching, and learning, experience. There are countless ways that technology can help a child get a better education. Today’s children know technology better than most of the adults out there. It has become the easiest way they learn because it is such an integral part of their life. Most students today have been using mobile devices like tablets and smartphones to play and learn since they could crawl. So it only seems logical to align today’s classrooms with the way that the students want, and are used, to learning. Classrooms equipped with the latest technology has not only helped them learn better, but they also acquire multitasking skills. Today they hardly know how to learn without it. Technology makes teaching and learning more meaningful and fun. When teachers effectively use technology into subject areas, teachers grow into roles of adviser, content expert, and coach. Teachers can come up with creative ways to teach their students, and will keep them engaged. Every child learns differently, and technology helps with this gap as well. Having access to other information outside of the book gives students many different ways to learn a concept. Learning is more hands-on as technology has changed the learning environment. Online encyclopedias and E-books provide masses of knowledge on almost every topic. The variety of sources allows students to pursue subjects in much greater detail rather than being limited to whatever the teacher sends home. Technology tracks and reports student’s progress instantly. Feedback provides instant motivation to improve performance. Students who use technology are often motivated to improve their performance. Trying to beat high scores with games at home, and trying to beat high scores in mathematics use the same psychology. Students and classrooms or even schools anywhere in the world can be connected instantly. Devices coupled to the Internet can allow for a free way to communicate globally. The chance to understand international or different cultural perspectives on the same topic is incredible. In this way, children learn about diversity, bridging the gap of time and distance, and are bringing the world closer than ever before. Children carry heavy backpacks, textbooks, and binders, which aren’t very efficient. A lightweight laptop weighs less than 5 pounds and can have an internal storage capacity of more than 2 million illustrated pages. In addition to an internal hard drive, access to the Internet can provide an almost unlimited source of information. Another way to benefit from advanced technology. One can find a great cheap tutor for children. With no need to travel, increased flexibility and advances in technology, online tuition is now a realistic – and increasingly common – tuition choice. Online tuition enables the same level of engagement as face-to-face tuition and within an environment that is familiar to children. The world is drifting towards the higher use of technology at a great pace. Teachers have a responsibility to introduce, encourage, and help students to master the gadgets. And at the same time they should be expert in the subjects taught in school. Technology will be used in every aspect of the professional lives of current students. So after school, whether the next step is college or career, the use and advancement of technology will be dominating irrespective of the choice of field. Why not begin early in life? Technology is not only helping students, but helping teachers as well. When it comes to expanding beyond the linear, and old school text-based learning, technology is playing a major role in all of this. Apart from that, in order to engage the students in the classroom and in studies, the advancement of technology dominates again. 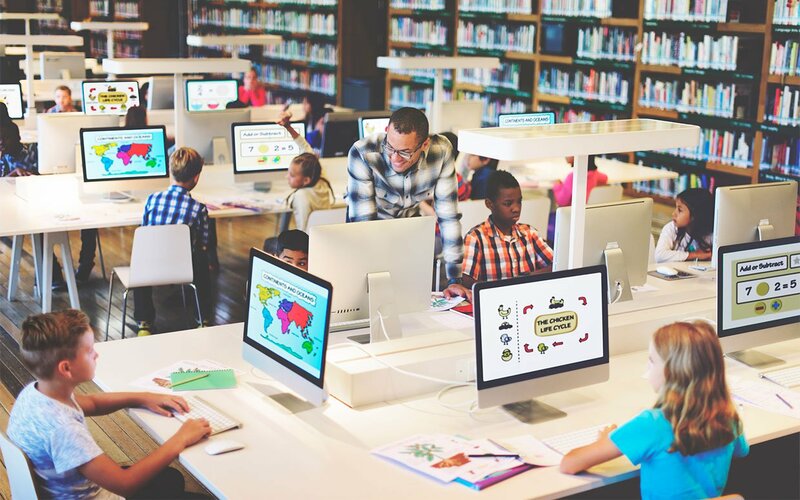 The role of gadgets, apps and software, has widely increased in schools not just for better learning but has also changed the way teachers demonstrate the concepts, even assign homework and projects. Nowadays assessment and analysis of the child’s progress is also done via technologically introduced apps and software. Carolette Alcoran is a Content Writer from the Philippines. She has rendered services accurately, and is flexible in writing various topics. She writes promotional advertisements, issues concerning both virtual and reality, lifestyle tips, marketing trends and also media’s effectiveness. Follow her on Twitter. Do you notice new and interesting ways technology is helping your child learn? Emma is using an iPad now at school because she has difficulty printing. She is a slow printer and has some fine motor issues, but now she can get her assignments done on time, at school. Share your experiences with me in the comments!